Baccarat Bar at Bellagio is the place for exotic specialty drinks and blended fruit and wine cocktails. Sit back and peruse the extensive cigar list while listening to the sounds of a baby grand piano while. 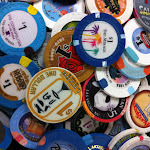 A laid-back, classic luxury Vegas atmosphere pervades, and loungers can overlook the high-stakes tables in the Casino. Nothing takes the edge off of paying eighteen dollars for a drink, like watching some unfortunate tourist lose five thousand dollars on one roulette spin.